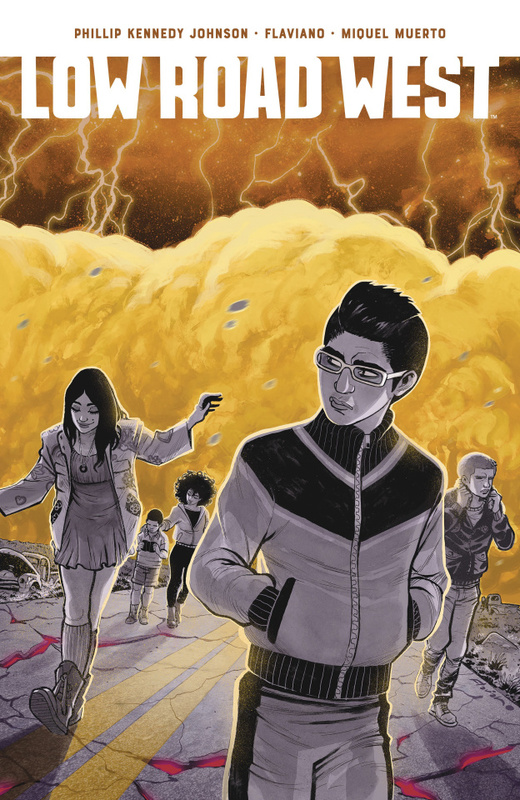 When five teenage refugees are stranded in an irradiated Oklahoma wasteland while trying to survive an exodus from the war-torn East Coast, they take shelter in a ghost town that is much more than it seems. The strange, unnatural threats they face there will make them question what they think they know about death, about reality, and especially about family as they learn to rely on each other if they fre ever going to make it to the sanctuary of San Francisco. Written by Eisner Award-nominated author Phillip Kennedy Johnson ( The Power of the Dark Crystal, Aquaman ) and illustrated by Ringo Award-nominated artist Flaviano ( Thanos, Spider-Man/Deadpool ), Low Road West is a story about coming of age in the throes of war, and carving your own path despite an uncertain future. Collects the complete 5-issue series.